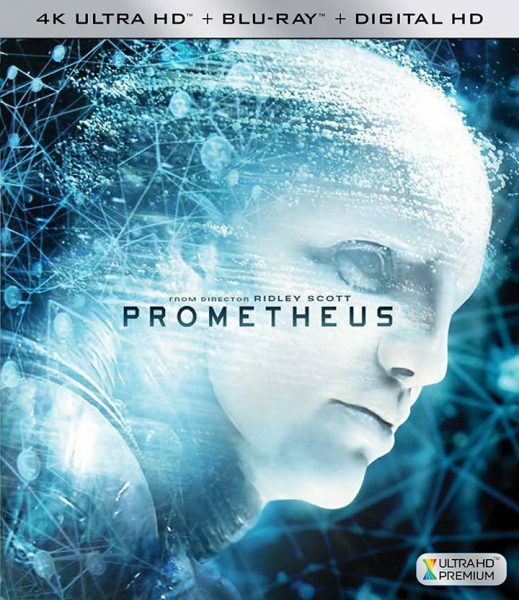 Ridley Scott’s 2012 film Prometheus will release to 4k Ultra HD Blu-ray on August 15th, along with the first disc editions of Alien: Covenant in both standard Blu-ray combos and exclusive retailer editions. Prometheus was one of the best looking Blu-ray Disc releases of 2012, and for many good enough reason to buy a now-doomed 3D TV set up. But while conventional Blu-ray discs max-out at 1080p resolution, the 4k Blu-ray release will provide 4-times the detail and feature High Dynamic Range (HDR) color improvements. Unfortunately, this combo edition from 20th Century Fox (MSRP: $39.99) doesn’t include a 3D disc, but it does include a Blu-ray and Digital Copy that we hope will redeem a Digital UHD (4k) copy with services like Vudu. We’re still waiting on confirmation of the audio specs. The soundtrack will likely not be upgraded to Atmos or DTS:X simply because the film was originally presented in Dolby Surround 7.1 (what a bummer). And, extras will probably be the same as previously-released Blu-ray discs. Nevertheless, this gorgeous film from The Martian cinematographer Dariusz Wolski will surely be one of the better titles for your home theater, and may add enough incentive to purchase an HDR-enabled 4k TV if you don’t already have one.